"Sanna Annukka has created for Marimekko a series of expressive designs full of meaning, telling stories from the Finnish national epic, the Kalevala. 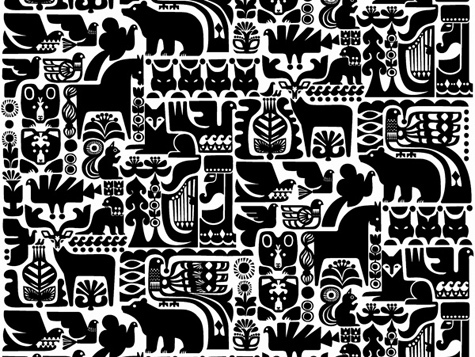 The Kanteleen kutsu fabric depicts forest animals that have, enchanted, gathered to hear the joyful tunes played on the kantele, a plucked string instrument, by Väinämöinen, the main character of the Kalevala. Väinämöinen, a shamanistic hero, had made his instrument from the jawbone of a giant pike. Mugs, tea towels and other ready-made products feature individual animals, birds, squirrels, bears picked from the Kanteleen kutsu fabric. The Sampo, a wealth grinding magic mill with a multi-coloured lid, is featured in the impressive Taikamylly fabric and matching cushion covers, plates and trays. The Ihmemaa art print, sold by the repeat, shows the landscape of Kaleva, the Land of Heroes, and Lake Alue. In the depths of the lake, a whitefish has swallowed fire fallen from the heavens. The series also includes the Onnen helmet duvet cover design, which tells of how Väinämöinen, moved as he played the kantele, cried big tears that flowed into the sea and there changed into pearls.